It is time for a blast from the past, as Konami brings Bomberman to the Nintendo Switch with an explosive all-new entry. 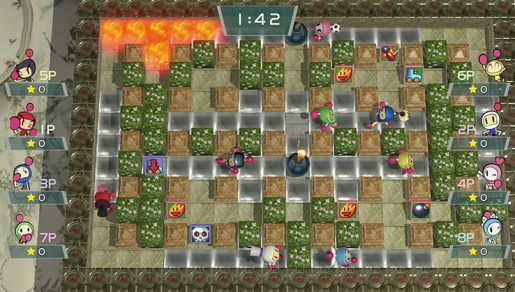 The last Bomberman title saw release in 2010 and many thought the series was destined to be a dud. After waiting several long years, Konami lit a match and ignited the Bomberman wick once again, and from the blast came Super Bomberman R. Featuring a challenging Story Mode and robust multiplayer options, Super Bomberman R is rich in content; but the question remains: Is it a multiplayer blast or does the fun fizzle? There are two main modes featured in Super Bomberman R – Story Mode and Multiplayer. In Story mode, the evil Emperor Buggler has awakened the Five Dastardly Bombers to aid him in his intergalactic conquest of the universe. Upon hearing of Emperor Buggler’s ambitions, Bomberman recruits his siblings to battle the Buggler Army and to save the universe from tyrannical rule. The narrative is told across a series of animated cutscenes – complete with enthusiastic voice acting. During these cutscenes, the Bomberman siblings deliver moments of levity courtesy of their distinct and whimsical personalities. Story Mode is lengthy and can be quite challenging as you progress through the game’s 50 stages and multiple worlds. In classic Bomberman fashion, you will use bombs to destroy the occupants of the stage, blow up walls to create paths or to collect power-ups. Stages will mix things up and present you with varying challenges – for example, a stage may require you to defeat all enemies or you may need to activate a series of switches to activate the warp zone. Each world ends with a boss battle, and these can be very demanding on the higher difficulties. Once you learn the movement patterns of a boss, some of the challenge will be alleviated, but Veteran and Expert level difficulty will still prove arduous for even seasoned Bomberman players. If this is your first foray into the Bomberman series, it is recommended you start the game on Beginner. Super Bomberman R’s Story Mode is entertaining and the challenge presented was a welcome surprise. You can tackle Story Mode on your own, or you can play with another player for local co-op. Whether played alone or with a friend, Story Mode is a pleasure and one that is inviting enough to revisit as you attempt to beat stages on a higher difficulty. 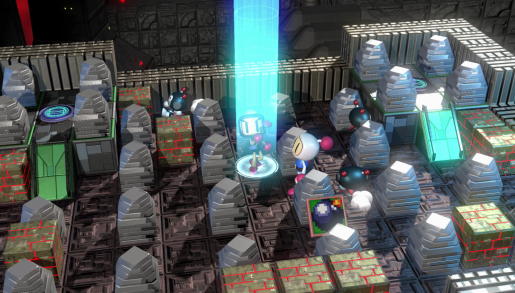 It is a classic Bomberman experience, and that makes it a blast to play. Multiplayer has always played an important role in Bomberman games, and that remains true with Super Bomberman R as the game features multiplayer for up to eight players via local and online play. Online offers two modes of play – League Battle and Free Battle. In League Battle, you earn BP and progress through the league as you reach new heights in ranking. Free Battle is a non-league battle and you can play with the rules of your choice. You can start a game immediately using Quick Play, search for friends, find a private room, or create a room and customize the type of match you want to host. When the online is working well, the multiplayer of Super Bomberman R is a lot of fun. Unfortunately, online games can be inundated by periods of lag. Lag in a game like Bomberman makes things all the more challenging, and it really diminishes the fun one will have with the game. Now, again, when online is working properly and there is no lag existent, the multiplayer is highly addictive and you could spend many hours playing it. Local multiplayer plays well, has plenty of customization options, and is a ton of fun to play with friends and family. 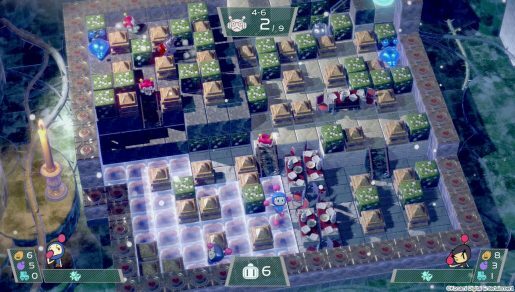 If you are looking for a local multiplayer game to play with folks, Super Bomberman R will deliver the thrills you seek. Playing online and making your way through Story Mode will award you with BP, which serves as in-game currency. You can spend BP on new stages for multiplayer, new playable characters, and custom gear for your characters. It’s a nice incentive to keep you playing to unlock these extras. Verdict: With the promise of DLC to come, it would appear that Konami has plans to support the game for the long-term. Super Bomberman R is a quality release for Nintendo Switch. With a challenging Story Mode and addictive multiplayer, there is good reason to pick this game up and to add it to your Switch library. The local multiplayer is a blast and some of the best fun you will currently find on the Nintendo Switch. If Konami is able to iron out the online lag issues, then Super Bomberman R will be one of the Switch’s must-own titles.